What was known as a traditional governmental procedure since 1790, is now a presumed and dangerous political weapon. Last Monday, the Department of Commerce announced that it would reincorporate the question of citizenship in the 2020 census for the first time in decades, which is perceived as "a move that could lead to an undercount of minorities living in the United States,” reported USA Today. The US Census is a protocol for population counting indicated in Article I, section 2 of the Constitution of the United States, and which states that "representatives and direct taxes shall be apportioned among the several States, according to their respective numbers." As the media continues, "the census count is used to redraw congressional districts, so it can affect the makeup of Congress, and determine where federal, state and local funds will be used to build schools, roads, healthcare facilities, etc." The usual format of the document, known as the American Community Survey (ACS), traditionally contained questions related to age, surface of residence, distance to work, professional training, etc., and since 1950 - and before the approval of the Voting Rights Act of 1965 - this citizen survey has rejected the questioning of the migratory status of the persons surveyed. But in a country led by an administration with open anti-immigrant positions - and with an important increase in the persecution and detention of undocumented citizens -, the addition of this question is interpreted by many as a "weapon for vote suppression". 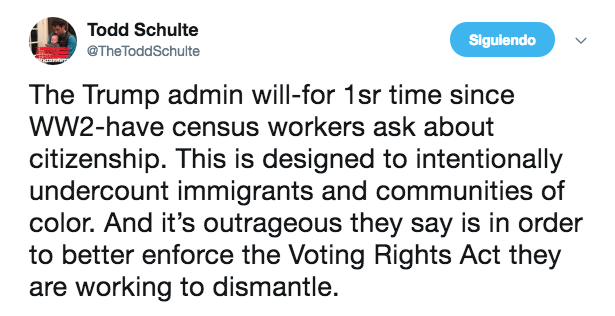 Although the Secretary of Commerce, Wilbur Ross, argued in his statement that the measure was intended to "help enforce the Voting Rights Act" and that "obtaining complete and accurate information to meet this legitimate government purpose outweighed limited potential adverse impacts", for Todd Schulte - president of the pro-immigrant activist organization FWD.us -"this is designed to intentionally undercount immigrants and communities of color. And it is outrageous they say is in order to better enforce the Voting Rights Act they are working to dismantle." And, in view of the new mechanisms of the Immigration and Customs (ICE) to locate and detain immigrants, the incorporation of this question in this precise political moment leaves very little room for the benefit of the doubt. As Jay Michaelson wrote in his column for The Daily Beast, "the Trump administration has ruthlessly pursued Latino and Muslim populations, deporting 'illegals' without due process even if they leave families behind (...) Immigration and Customs Enforcement has used any information available to do this, even information that was supposed to be confidential. " Similarly, there are those who also attributes the move to the imminent danger that runs the White House party of losing government control. After his victory in the presidential elections, Donald Trump had already denounced an alleged "illegal vote" in favor of Hillary Clinton: "In addition to winning the Electoral College vote in a landslide, I won the popular vote if you deduct the millions of people who voted illegally," he wrote on Twitter on November 27, 2016. Today, and as reported by CNN, his reelection campaign clarified the matter when sending an email that read: "the President wants the 2020 United States Census to ask people whether or not they are citizens. In another era, this would be COMMON SENSE, but 19 attorneys general say they will fight the President if he dares to ask people if they are citizens. The President wants to know if you’re on his side." According to the Washington Post, at least two attorneys general (Eric T. Schneiderman of New York and Xavier Becerra of California) have initiated legal proceedings against the measure. Between district manipulation ("Gerrymandering") and retaliation against the immigrant community, "the weaponization of the Census underscores how even the most technical, bureaucratic processes underlying democratic governance have become twisted by partisan warfare," concludes Nguyen.